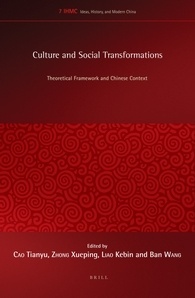 This book is the second collection of essays based on the “Culture and Social Transformations in Reform-era China” conference held in Hangzhou, China, in 2009. It joins a growing body of research exploring the socio-political and historical meanings of China’s postsocialist transition, but distinguishes itself as a work that focuses on identifying “central links between culture and social transformations.” Two of the editors, Cao Tianyu and Zhong Xueping, justify the choice of this particular methodological approach in the Introduction by explaining the connections between three key concepts: “social life” (defined as “the specific meaning structure constructed by active individuals”), “culture” (understood as a historically conditioned community of meanings), and “meaning” (used to refer to “the intentions, values, norms, and expectations that make life understandable and worthwhile”). Culture occupies a particularly important position in this meaning system, not only because it expresses our responses to and reflections on the present, but also because it contains a critical potential that “implies and prepares for a breaking with the past and the creation of new meaning and new culture”(2). Hence, Cao and Zhong propose that an examination of knowledge-production and intellectual debates and, in particular, the formation and evolution of hegemonic discourse in post-socialist China, is crucial to a better understanding of how China has transformed itself from a socialist state to a rising global power and of the attendant challenges and crises that the country is facing today. Following the Introduction are fifteen essays by academics and intellectuals from China and beyond. Although these cover widely disparate topics, the editors have conveniently grouped them into three parts (not an easy task), each part corresponding to a terrain where culture and social reforms are intimately intertwined. Part I explores how the migration of Western ideas and values in the twentieth century has shaped the contours of intellectual fields, cultural practices, and cultural institutions in China. The opening article of this section “Modernism, Modernity, and Individualism,” written by Nan Fan, is a response to recent Anglophone studies of Chinese modernism informed by postcolonial theory that privilege “nation” as an analytical category and promote the “oppression-resistance” paradigm in analyzing global cultural exchange. Nan Fan suggests that “investigation into modernism and the ways that it enters [into] various dialogues within the nation is one way to truly destroy imperialist cultural hegemony” (24). Thus, he examines the vicissitudes of modernism in twentieth-century Chinese literature by focusing on modernism’s involvement with Chinese modernization. For this reader, there is a marked lack of clarity in the key concepts used in this essay. Chinese enlightenment in the 1980s is trivialized as “the freedom to openly exercise one’s own reason in all things” (27). In one place, it is suggested that modernity is “one of the core issues of [1980s Chinese] enlightenment discourse” (39); elsewhere modernity is defined in accordance with Matei Calinescu’s conception of the “two modernities,” namely, “capitalist modernity” and “aesthetic and cultural [modernity]” (43). Toward the end of the essay, “antimodern modernity,” a notion proposed by Wang Hui to characterize the uniqueness of Chinese socialist modernization, is introduced. To untangle the relationship between all these modernities, a redefinition of modernism seems to be needed. Contemporary Chinese literature’s relation to social experiences is addressed in Li Yunlei’s contribution entitled “Subaltern Literature: Theory and Practice (2004-2009).” Li describes “subaltern literature” (底层文学) as a particular category of literature on the margins of the Chinese literary realm. It takes “excluded and disempowered social groups as its subject,” but differs from “migrant literature” (打工文学) written by migrant workers in that it is created by intellectuals and professional writers. Informed both by subaltern studies and by his knowledge of the Chinese left-wing literary tradition, Li not only discusses the moral implications of “intellectuals speaking for the subaltern,” but also perceptively points out the leftist predicament in China, as revealed by the adoption of “subaltern” instead of “left-wing” as a designation for this kind of literature. Nevertheless, he sees that “subaltern” indicates new possibilities of integrating various theoretical resources and believes that a socially responsive and aesthetically innovative kind of subaltern literature should be created both by intellectuals and by subaltern subjects. Moving away from the field of literary production to the domain of intellectual history, Lu Xinyu’s article, “The ‘Crime’ of Lu Xun, Anti-Enlightenment, and Chinese Modernity: A Critique of Liu Xiaofeng’s ‘Christian Theology,’” critically reflects upon an important intellectual trend in the 1980s that negates wholesale Chinese enlightenment thought and the twentieth-century Chinese revolution. Among Chinese intellectuals, Liu Xiaofeng 刘晓枫 has undoubtedly established a distinct voice due to his insistent promotion of “cultural Christianity” (文化基督教神学) as an antidote to a nationalism allegedly based on and appealing to resentment and as a solution to the problem of human nihilism. Lu astutely points out that Liu’s theory, which is built on the religious ethics of Christianity and phenomenological hermeneutics, “disinfect[s], bleach[es], and carve[s] out the rot from Western Christian theology in such a way as to ‘depoliticize,’ ‘de-Westernize,’ and ‘de-historicize’ it, thereby making the Christian eschatology a universal one and the only deliverance” (90). She further argues that Liu’s Christian theory, as a particular kind of Western-centrism disguised as universalism, is deeply problematic by virtue of its paradoxical relationship to enlightenment. Considering its emphasis on the individual’s direct relationship with God as well as its intentional self-positioning vis-a-vis the intellect and realm of culture, Liu’s cultural Christianity is incapable of realizing justice in reality. Daniel F. Vukovich’s essay, “From Charting the Revolution to Charter 2008: Discourse, Liberalism, De-Politicization,” draws attention to another front in the discursive struggle: the production of hegemonic political discourse. He argues that a rightward shift in the politics of knowledge in contemporary China “has much to do with not just the resurgence of economic liberalism and class interest, but the category of ‘the individual’—the properly autonomous, naturally rights-bearing subject” (108). He further asserts that the rise of an unreflexive liberalism that fetishizes development and individuality obstructs the formation of a collective, egalitarian, or mass sense of democracy. Vukovich argues that Liu Xiaobo’s “Charter 2008” in fact advocates a managerial and administrative mode of politics, and thus exemplifies how liberalism depoliticizes. This section concludes with Liao Kebin’s contribution, “The Transformation of Chinese University Culture: History, Present, and Path.” In order to seek the historical and cultural roots of the worrisome state of contemporary Chinese higher education, Liao not only compares national learning academies (国学院) and Shuyuan academies (书院) in imperial China with medieval universities in Europe but also traces the development of Chinese higher education during the first part of the twentieth century. He asserts that the “subservience to the autocratic imperial court and thorough pragmatism,” which characterizes the Chinese higher education tradition, is still alive and contributes to the deteriorating capacity of Chinese universities to uphold moral principles and cultivate top-class creative talents. Had Liao been better informed about recent higher-education reforms in many Anglophone universities and the ongoing heated debates about the corporatization of higher education in North America and Europe, he would have been able to avoid adopting an occidentalist perspective and to situate his critique of Chinese higher-education culture within the context of deplorable educational developments driven by global neoliberalism. The second part of the book is devoted to a discussion of such highly contentious notions in today’s China as democracy, human rights, and the rule of law. The first essay, “Academic Discourse, Official Ideology, and Institutional Metamorphoses: Reflections on Contemporary Chinese Legal Discourse and Reality,” written by Yu Xingzhong, examines how Western legal discourse on the rule of law, rights, and judicial independence has transmuted into legal discourse with Chinese characteristics such as “a socialist rule of law” or “state legalism,” the supremacy of “right to subsistence” over other types of rights, and limited judicial independence. Through a detailed discussion of Chinese judicial reform since 1978, Yu points out that, limited as it is by Chinese legal tradition and by official ideology, the existing legal discourse can hardly influence institutional and social transformation. The next chapter, “The Flight to Rights: 1990s China and Beyond,” by Rebecca E. Karl, problematizes an exceptionalist perspective on the Chinese state and its jurisdictional order by focusing on a specific social phenomenon since China became integrated into the world economy in the 1990s:“the flight to rights.” Karl argues that the pursuit of legality, in particular the right to privacy, is China’s response to the contemporary global juridical order. Seen in the context of the global capitalist configuration driven by neoliberalism, China’s flight to rights is systematically limiting, since it is a manifestation of a general trend toward the depoliticization of social life. Ban Wang’s essay “Human Rights, Revolutionary Legacy, and Politics in China” is a two-pronged critique of the dominant liberal discourse on China’s human rights situation and, in particular, of the fetishization of individual rights. On the one hand, by tracing the conceptual mutation of “right” in Kant, Hegel, and Marx, Wang points to an often neglected tradition in Western history of vibrant intellectual endeavor to liberate right from its “individualistic closet” and endow it with communal dimensions. On the other hand, by invoking examples from Chinese socialist art and revolutionary practices that promote distributive justice and cultivate the proletariat’s socio-economic rights consciousness, he forcefully shows that the defense of rights is deeply implicated in political participation and collective movements and argues for the revolutionary legacy’s relevance to today’s China. Part II ends with “Democracy: Lyric Poem and Construction Blueprint” by Han Shaogong, the renowned Chinese writer and the only non-academic among the contributors. Han critiques the “lyrical poetry” approach to liberal democracy –a penchant for lauding democracy without actually understanding the limits of the democratic political system in such areas as the handling of foreign affairs and long-term socio-economic planning. He advocates instead a practical attitude, namely the “construction blueprint” approach, in order to “improve democracy through a dynamic process and realize more diverse forms of democracy in this complex world” (224). The last section of the book contains six articles loosely connected by their concern with China’s social transformation in the historical and global context of capitalist development. The opening chapter of Part III, “Rereading ‘Commemorating the Three Hundredth Anniversary of the Fall of the Ming,’” written by Han Yuhai, offers an original interpretation of the demise of the Ming dynasty by considering the interactions between the global market, the state, and the domestic market-building process, a perspective that was neglected in the 1944 Chinese intellectual debate on this seismic historical change. He argues that the state’s excessive reliance on the world market and currency imports and the “continued decline of state capability” (国家能力的持续下降) eventually led to the downfall of the Ming. This is certainly a valuable lesson. This is followed by an intriguing article, “The Crisis of Socialism and Efforts to Overcome It,” by Cai Xiang, who turns his attention to crisis-production integral to Chinese socialism during the first thirty years of the PRC or the “After [the] Revolution” (革命之后) era. Cai asserts that the conflict between the utopian ideal of socialist revolution and the practical needs of construction and governance entailed by nation-building expresses itself in five categories of contradiction: Egalitarianism versus Social Class Differentiation, Bureaucratic Hierarchy versus Mass Participation, Political Society versus the “Life-world” (生活世界), Internalization (内在化) versus Objectification (对象化), and Maintaining Reality (维持现实) versus Facing the Future. His discussion of all these categories of contradiction is illuminated by his sensitive use of cultural texts ranging from fiction to political writing and legal texts. The article can also be regarded as a theoretical overview of Cai’s fascinating book Revolution/Narrative (革命/叙述). The next chapter, “Post-Socialism Revisited: Reflections on ‘Socialism with Chinese Characteristics,’ Its Past, Present, and Future,” by Arif Dirlik, echoes Cai Xiang’s concern with the contradictions that Chinese socialism continuously produces. In view of China’s ambiguous relationship with the global capitalist order—despite its incorporation into global capitalism, China is committed to pursuing an alternative to capitalism—the essay revisits the concept of “postsocialism.” Dirlik first used this term more than two decades ago; here he reconsiders it not in order to raise questions about the possibility of a socialist future, but to rethink the whole question of socialism in the present. Dirlik argues that China’s revolutionary legacies, in particular, a flexible mode of thinking, a propensity for experimentation, and Mao’s concept of contradiction, have undergirded China’s bold experimentation of socialism in the past thirty years and will continue to inform China’s strategies for tackling the contradictions arising in the social, economic, and political realms. Yiching Wu’s stimulating article “Reinterpreting ‘Capitalist Restoration’ in China: Toward a Historical Critique of ‘Actually Existing Market Socialism’” bears out the fruitfulness of a critical analysis of China’s socialist past for a better understanding of Chinese socialism in the present. The essay offers an historically grounded analysis of China’s “socialist market reforms” in terms of their relationship to long-term class formation within socialist China. Drawing upon Antonio Gramsci’s notion of passive revolution, it argues that marketization “begins as the passive strategy of the ruling-class for self-preservation and political appeasement” (314), but eventually enables the ruling-class to transform themselves from power-holders to capital holders and creates the conditions for socialism to mutate into capitalism. The essay thus demonstrates that a relentless self-criticism of socialism is a significant avenue for critiquing neoliberal-capitalist development in today’s China. What follows is Robert Wade’s “The Western Slump and Global Reorganization,” which discusses the global reorganization after the Great Recession and Western economic discourses that perpetuate the flawed existing international financial system. Wade notes that the national and international public policy responses to the 2008 financial crisis, which were grounded in neoliberal ideology, failed to effect a much-needed radical reform that would rectify the two fundamental problems intrinsic to the structure of the international financial system: (1) the mechanisms of adjustment to external surpluses and deficits became the onerous burden of the deficit countries; (2) with a national currency (USD) doubling as the main international currency, there is bound to be “a trade-off between enough liquidity in the expanding world economy and a stable value of the international currency” (328). As a result, superficial reforms in the US and in the international financial regime make “the evolving system more prone to regional or global crises than before” (316). Wade ends his essay with the proposition of several Keynesian measures to reduce global imbalances. Although the article is only tenuously related to the book’s key foci—cultural and social transformations in China—it does offer a critical point of departure for imagining China’s future within a crisis-ridden global economic system. In the concluding chapter of Part III, “An Argument for ‘Participatory Socialism,’” Lin Chun envisions a future socialist welfare society that takes “participation” as a legitimate principle and provides a basic guaranteed income for all members of society, based on multiple forms of participation and contribution, without setting an upper limit on that income (333). Dissatisfied with the narrow focus on workers’ rights in the current discussion of China’s unemployment crisis, Lin suggests fighting the unemployment problem at its roots through the conception of a new economic system as an alternative to the current profit-driven system. She suggests detaching “wages” from “work” and replacing the concept of “employment” with a more socially inclusive notion of “participation,” a notion that covers all forms of “socially necessary labor,” acknowledges both rights and respect, and advocates both individual freedom and communitarian solidarity. Lin further notes that, if China is committed to its socialist ambition, the country could make good use of its collectivist traditions to achieve institutional innovation and support a modern “welfare society” far more flexible, cheaper, and more compassionate than those of the capitalist “welfare states” (345). Nearly two-thirds of the articles included in this book were originally written in Chinese. They have all been consistently rendered into clear and fluent English by Adrien Thieret. The book would have benefited from more careful editing. Typos are scattered throughout. For example, the English translation of the Chinese phrase shun zhi zhe chang, ni zhi zhe kun (顺之者昌，逆之者困) on page 84, “those who conform to [globalization] will flourish and those who resist it will run into,” is apparently incomplete. It would also have been helpful for readers becoming acquainted with the rising generation of writers of subaltern literature if the Chinese characters for these writers’ names had been provided. Despite these quibbles, this book makes a good contribution to the growing field of theoretically informed critical Chinese studies and provides rich food for thought. More important, it should be recognized as part of a continuous struggle being waged to counter neoliberal global hegemony. These important questions have been explored from the vantage point of various disciplines. See Lin Chun, The Transformation of Chinese Socialism (Durham: Duke University Press, 2006); also Ban Wang and Jie Lu eds., China and New Left Visions: Political and Cultural Interventions (Lanham: Lexington Books, 2012). Liu Xiaofeng draws heavily upon the phenomenologist Max Scheler’s ideas of resentment in his interpretation of twentieth-century Chinese revolution. “Resentment” would be better translated into “ressentiment” in order to preserve the complex discursive meaning and intellectual history encapsulated in this term. Nietzsche prefers the French word ressentiment to the German Empfindlichkeit when characterizing a bitter emotion based on a sense of inferiority and frustrated vindictiveness. He attributes the genealogy of ressentiment to Christian slave morality. Scheler’s deployment of ressentiment critiques Nietzsche’s failure to understand Christian love and shifts the locus of this emotion to the bourgeois morality. As for Liu, he relates ressentiment to national psychology and emphasizes nationalist ressentiment as a driving force behind China’s pursuit of socialist modernization. See Friedrich Nietzsche, On the Genealogy of Morals, trans. Walter Kaufmann (New York: Vintage, 1967); Max Scheler, Ressentiment, trans. Lewis B. Coser and William W. Holdheim (Milwaukee Wisconsin: Marquette University Press, 1998). Cai Xiang deliberately chose to use the odd-sounding term “After Revolution” to distinguish the formative years of the PRC from China’s post-revolutionary period (1949-present) or post-socialist era since the 1980s. This is also to distance his analysis from criticisms informed by all kinds of “post-” theories.